As I have blathered on about here, I am currently without a real sewing room. So far, everything is mushed in my guest room (at some point to be sewing room). Doesn’t that look like it could totally work? I’d never really thought about hanging cabinets in my sewing room, but it would be a terrific use of space. This could be one side of the room and the other side would have sewing tables and my cutting table in the middle. Fantasies, all! But, it at least has me thinking about how I want the room to take shape. And, that my ‘solution’ doesn’t need to be as simple as tables from Costco and some shelves. I really like the idea of turning that room in to a real creative sewing space! I think it will make you happy, and you should do it! I was surprised to notice, just a few weeks ago, that Ikea sells sewing machines too. At least I think it was for sale and not just a prop. Any artist can tell you how important it is to create a work space that makes you happy to spend hours in. It’s also a visual statement that you take your creative work seriously. Go for it! You and your work deserve it! Our apartment here in Germany is furnished almost entirely in IKEA since we chose not to have our (large) furniture shipped from the US. I can attest to BESTA being good quality and well thought out for assembly. We used it to make a TV wall unit and a cabinet to store our wine bottles and the wine and beer glasses. I’m always thinking of furniture for my sewing room, but since it’s also the guest room, space is a premium. I haven’t yet found a magical cutting table that will have a large cutting surface but fold up to nothing for storage. I stupidly didn’t have my cutting table shipped here but at least I do have my Koala sewing cabinet and machines. It’s an investment I doubt you’ll ever regret! And a perfect celebration of the revised living situation! I have an IKEA Norden folding gate leg table that a friend modified for me with a wheeled platform to bring it to a better cutting height–and allow me to move it easily (necessary because it weighs about 100 lbs!) It has lots of small drawers and now with the platform a long space for rolls. Tiny when folded up, huge when open all the way. Love it! Sounds good to me … I sew in our main living area … when my daughter takes her furniture with her, her bedroom will become my sewing room once again. It will be about 2-3 more years before that happens. 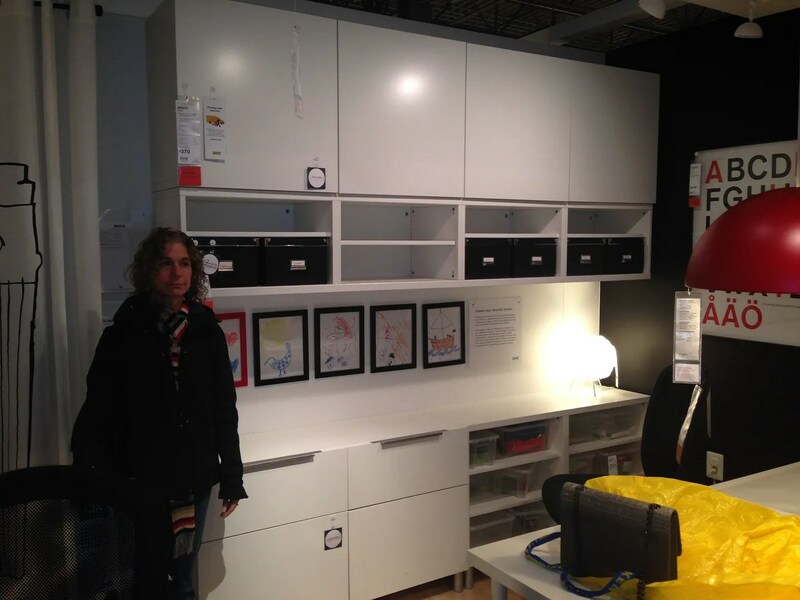 I love ikea! Their expedit shelves saved our playroom. I searched for a while to find storage for my sewing room which is the size of a small bedroom. I ended up using 1950s china cabinets with the glass doors removed. Their like 6ish feet tall and huge like all great old furniture. I have all my fabric folded and organized by pattern (stripes, polka dots, solids, floral etc) on the shelves and the drawers/cabinets below store all my buttons and zips etc in plastic bins. The one cabinet also has a really awesome cubby space that is home to my buttonholers and pinking attachment. It has a fold out bar cubby (very don draper) and I hide my floating junk and maintenance stuff. You can get your desired decade on Craigslist for a great price, often including a table and matching chairs. My cutting table was a dining table and came with one of my cabinets. I hung IKEA kitchen cabinets over my sewing table. I love it. GO FOR IT! Use your left over available wall space for framed peg and cork board, shelving etc. Use the walls girl. Go to the ceiling, even if it is gorgeous covered boxes on top of the cabinets. Everyone needs a great sewing space. As much as you sew and enjoy sewing, GO FOR IT! 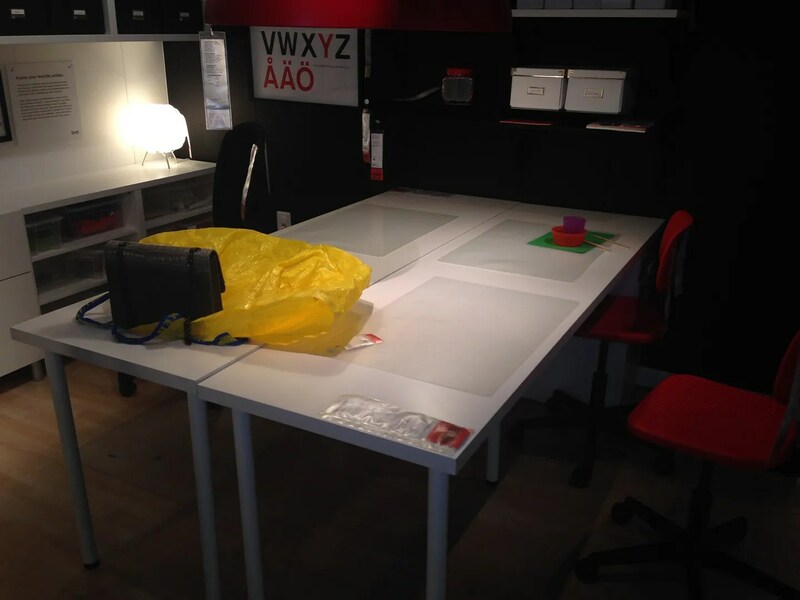 You deserve a space that encourages your creativity. I agree with Silvia, a lady cave! Oh, Ikea. They had a pine wall shelf/desk combination displayed in our local store as a sewing studio (fake machine and all!) and I took a picture… I think you should definitely go for it! You may not need a whole room if you use the space thoughtfully, and I feel like having an effective set up really helps facilitate creativity and productivity. Go for it as soon as you are able to do it. This is one of those things that is not luxury! When it comes to the creativity that feeds the soul my mother always told me, “Buy the best tools. You need the best tools to do the best work.” I’ve heard her word many times at creative decision points and you know what? She was right every time. You are such a skilled sewista. Honor that talent and skill by getting a real atelier set up and going now. It’s a “big chunk” of action, but you will sigh lovingly every time you enter your sewing cave. New life as a new wife…certainly deserves a new sewing room…love the term “lady cave”! A stash deserves a good resting place and white cabinets are perfect for creating and cleaning up and being a backdrop for some wild creative ideas…is your new hubby handy with a screwdriver as well as a spatula? IKEA is crack for home decorators. I don’t think I have ever gone into that store with out buying something! Go for it – you won’t regret it. Whoa, that looks great. Hanging cabinets and an island cutting table are great ideas. Oh and by the way I use those pleather cases in the narrow shelves to file patterns on the side. It’s worth going shopping with either the measurements or a pattern in hand to check if the dimensions work. The tables can be a little bit wobbly, but you can’t beat the price.